To jump-start creativity, keep a supply of old newspapers on hand. For information processing and communication exercises, students can write new captions for photos, draw new pictures to go with articles, or write new headlines for articles. 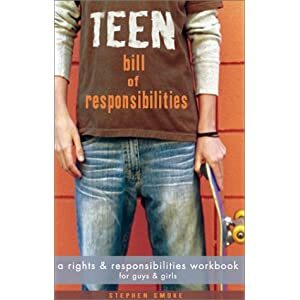 Perhaps responsibility isn’t exactly running rampant these days, if twice in the same day I read a quote from the Spiderman movie, “With great power comes great responsibility.” The second reference comes from the introduction to Stephen Smoke’s new book – Teen Bill of Responsibilities: A Rights & Responsibilities Workbook for Guys & Girls. Use music to create a mood for creative writing. Use a CD or tape player and bring your own music or ask for suggestions from your music teacher. Have students create a short auto-biographical essay or list of personal facts, then decorate it with a photo and a fingerprint. You can guarantee that no two will be the same. Learning about adhesives is a real-world experience. Here are ideas to help the experience stick with your students. The student will identify adjectives and adverbs and be able to use them correctly in a Christmas-related creative writing project. In this introduction to public speaking, students will learn how to deliver an organized, persuasive speech to an audience. Do as I do… Set a good example at a school level by encouraging all staff members to exhibit the same behavior expected of students. Recognizing the order of events not only helps in reading comprehension with stories or historical events, but also provides a foundation for breaking large tasks into manageable pieces that must go together in proper order. This exercise pairs students who will do the preparation work for you. Using “Alexander and the Terrible, Horrible, No Good, Very Bad Day” to inspire students to write. Have students interview their parents about certain historical events, taking notes about where they were and what they remember, to share later with the class. The classic childrens novel by E.B. White opens a world of possibilities for classroom projects and lesson plans. Full of themes involving friendship, loyalty, farm animals, this list goes on and on. In fact, we have a rather long list, submitted by another one of the dedicated T2T contributors. While these ideas aren’t complete lesson plans, we know a little creativity can go a long way. If you sense the Web is one big ego trip, it would follow there would be lots of resumes, and resumes there are. So if you need a good computer, business or English class project with real-world applications, or want to turn students loose on a mission on the Web, have them research and write resumes. And for teachers, it never hurts to have a current resume on file. You may not need it for a new job, but it can be timely and impressive at evaluation time. Rhyming and writing poems for all grade levels.